The contemporary styling of our Linea line has been expanded to include an entertainment cart. 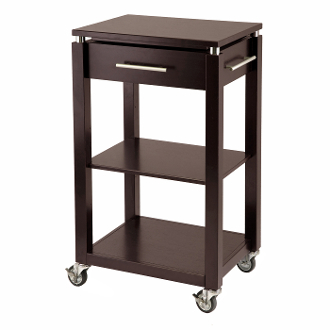 The cart is 21.65L x 15.75"W x 35"H; it comes with locking wheels, brushed stainless handle, one drawer and two shelves. The solid wood construction is finished in our rich espresso matte color. Overall Kitchen Cart size is 221.65"W x 16.38"D x 35"H. Top surface is 21"w x 15.75"D.
Construction with combination of solid and composite wood in espresso finish. Assembly Required.